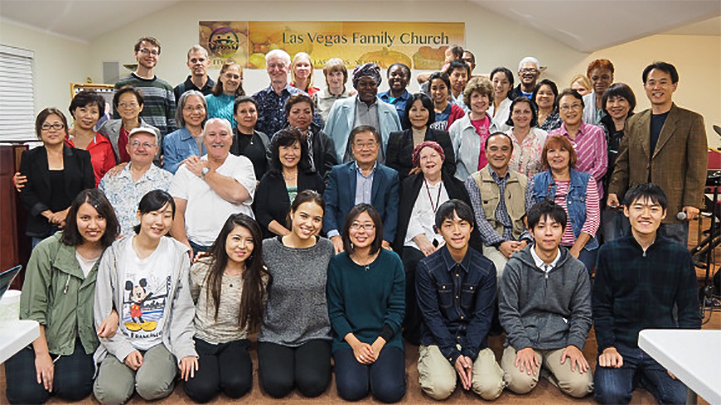 Las Vegas Family Church: Friday, November 7th, church pastor, Reverend Ken Doo hosted a church community meeting in Cheong Hwa Gung’s church sanctuary. This meeting was held in order to discuss and share some methods that could be used to strengthen and inspire the growth of the church community. The meeting began with a prayer and a light dinner of chicken, rice, kimchi and salad. Whilst everyone was enjoying the food, the seven newly arrived missionaries (4 girls and 3 boys) sang two beautiful songs that they had prepared. The first song was a classic “Lean On Me” with a cuter Japanese youthful twist to it and the second was a humble Japanese favorite called “故郷/Hometown”. After the singing and most of the eating, Bishop Kim Ki Hoon was asked to share a few words of wisdom with the gathered congregation. Bishop Kim Ki Hoon gave a detailed speech about True Mother’s instruction on Tribal Messiahship and its relevance within the Unification Community. Bishop Kim expressed True Mother’s explanation of Tribal Messiahship which is Witnessing. Tribal Messiahship is the accomplishment of 430 Blessed Couples. This does not mean the Holy Candy blessing. Instead, this means the Holy Blessing Ceremony in which True Parents preside over and proclaim newly Blessed Couples. Before True Father passed into the Spiritual World, he had tried to educate us, members, with the Divine Principle and Tribal Messiahship stating that through a clear and heartistic understanding of the Divine Principle, Tribal Messiahship can be accomplished. True Father heavily emphasized that only through Tribal Messiahship can the Kingdom of Heaven (Cheon Il Guk)be built. This was his last will and testament. Bishop Kim explained the reason for True Mother’s arrival to Las Vegas next month is not solely based on celebrating. She is bringing many young people with her from different nations who have successful experiences with witnessing. Bishop Kim reiterated the importance of this nation of America and how it has been prepared by Heavenly Parent for 2,000 years. Lastly, Bishop Kim gave us advice which was that we, as members, must not think only of growing the Las Vegas Family Church. He explained that we must have the mind of True Father when he first came to this nation—he thought of how to unite and God-center the world. We must have this kind of mindset. After Bishop Kim’s speech, a group photo was taken and Bishop Kim left the sanctuary to continue his mission. What is tribal Messiahship and how do we do it?